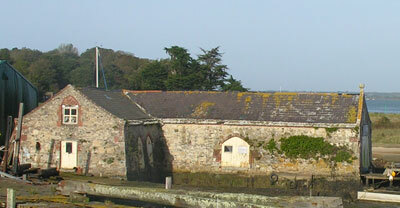 The Yarmouth ‘Sand House’ is a Grade 2 listed, 18th century building on the western side of Yarmouth harbour (actually in the Parish of Freshwater) now (2016) within the Harold Hayles Boatyard; it is the oldest commercial building still in use in Yarmouth Harbour. It is built of stone rubble with red brick dressings; the roof is of slate with the two lower courses of stone. In the eighteenth century, the sands of Alum Bay were found to contain an extremely pure white silica which suited glass manufacture. The ‘Sand House’ was built by the Urry family and used to store sand shipped around the coast from Alum Bay before being shipped to the mainland in larger vessels. The trade ended in the mid 19th Century when sand from France was found to be an alternative and easier to obtain in quantity.